For years, Keith Hall struggled with drug addiction and mental illness. Now, Keith is a mental health professional who works for Contra Costa County. A few days ago, he spoke to a group of police officers. One of them mistook him for a doctor. Someday, he just might become one. 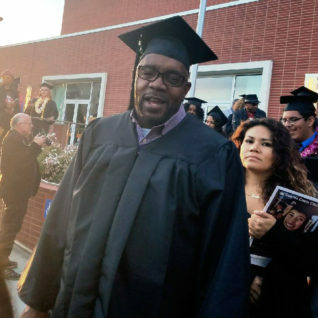 Mickles is the chair of the Health and Human Services department at Contra Costa College, where Keith enrolled in a moment of clarity a few years ago. He had been clean for two years, and worked odd jobs in construction and retail, but was still living in an El Sobrante treatment facility with no clear path forward. Desperate and exhausted, Keith knew something had to change. “My life wasn’t going anywhere,” he remembers. At first, he was nervous. He hadn’t been to school in years and didn’t know whether or not he could succeed. He even switched from day to night classes to be around more students his own age. But, he soon grew to love the school. And when a friend told him about CCC’s Service Provider Individualized Recovery Intensive Training (or SPIRIT) program, he decided to give it a try. Keith’s first job after coming to CCC was at a nonprofit, where he was promoted to assistant coordinator and even ran his own center in Antioch. Still, he wanted to do more. So Keith decided to stay in school. Eventually, he earned four certificates and an associate’s degree from CCC. And, he got a better-paying job with Contra Costa County, where he is now a Substance Abuse Counselor for people on probation. “But I don’t have to stop with the AA,” he adds. “I can go, I can grow.” Now, he’s going for a bachelor’s degree from a four-year university. Keith says that joy in helping others is a core part of CCC’s program. He’s encouraged other people to enroll at CCC, and helped fellow CCC students get jobs.